An Export businessman found that Everlasting Blossoms could make an excellent export business. After he visited my mother, he realized that Everlasting Blossom couldn’t be produced as other handcrafts. Just as an artist that every picture he drew or sculpture he sculpted would not be always looked same. Put a pin at the back of each butterfly. There should be 6 different group of people to work it out. 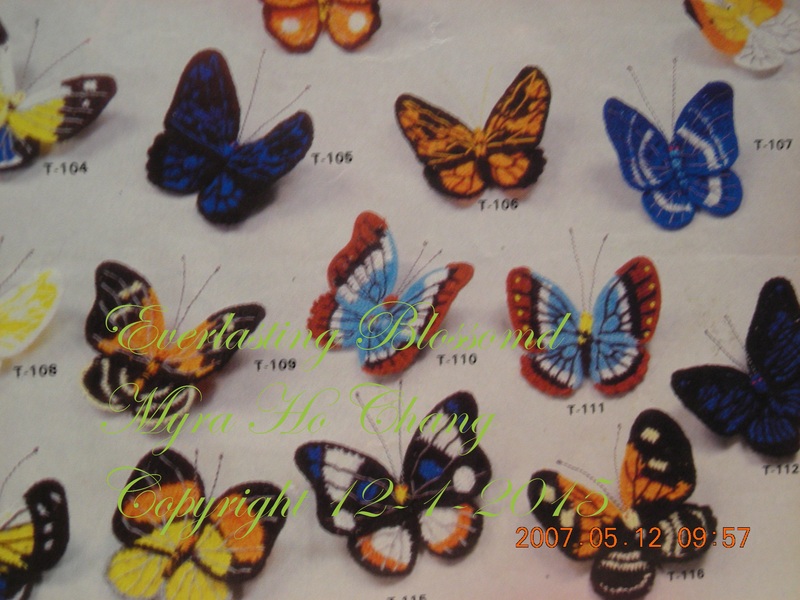 In this division of labor manner, the butterflies can be produced in large quantities. My father was an Air Force captain. A wife of a serviceman would understand better the arduous live of serviceman’s family. At that time, there were many unfinished products from export factories which needed to be finished by human hands. They sent these unfinished products to those serviceman home who need to have some extra money for their daily living. My mother thought whatever the export businessman suggested would benefits those families. She excepted the suggestion. The export businessman supply all the materials and tools. To pay the labor on time. My mother will take care of make the designs and look for workers and teach them how to work it out. The news spread out and was responded very well. Because the work was not hard, will not take too much room, was no filthy. Besides, the remuneration was very good! The export business man was very satisfied with those butterflies. He started to sent out the advertisements abroad and waiting for the orders. The export businessman had good reason to be very satisfied with those butterflies! Fantastic that he started sending advertisements for them abroad 🙂 I hope he got many, many orders for them! Unfortunately they lost contact ever since! Oh dear! Such a shame…. !